It's been a while since we had a cute product on C.O. TOO LONG in fact! Well, leave it to the Swedes to solve that. I totally want one of those. Looks just like one of my guys . . . except, of course, for the whole "bed" aspect. Is it just me, or does it look a little like a Daniel Boone-style hat? If I was a cat I would pee on it and walk away. That looks exactly like my cat, and I'd probably freak out after stepping on it while stumbling to the bathroom at 3am. It may just be the angle of the photo, but that looks like a rather cranky cat bed. The one that your cat naps in when he wants to say, "I don't care how cute you think I am, stop waking me up and petting me.!" Its 35 pounds in the UK - thats $75! Ouch! I wish those were slippers! Then I could have cranky feets! HISS-sterical. That is the cat's Meowith. I thought it was absolutely adorable and wanted one until I saw the price tag oon it - $59.99 U.S. pluse S/H etc... Still think it's cute but will pass on the purchase opportunity! Good Grief it's cute but not for that price. Thanks China's Mom you saved me from looking it up. I want a human-sized one! I have a li'l black cat - this would turn her into the top cat of Neko Koneko (black cat type)! I love it! Not that the cats would give it any interest. The hell with them, I will lay in it myself! Looks like a cat-shaped Roomba-- a Mewmba? If I were a cat, I would be totally freaked out by this! The tail KILLS me! Every time I look at it, I'm in tears. I can't believe that Ikea has the nerve to charge $20 more for the exact same thing in Canada...something that's over priced in the US in the first place!! Ikea is usually inexpensive, so it surprised me when I saw the price. I actually saw this ages ago and told my friend I'd like to buy it for her black, yellow-eyed kitty. http://www.literaryramblings.com/Pics/3.jpg My friend loved it, but told me not to waste my money, as her kitty would just pee on it...lol! Either way, if I did buy it, I'd go down to Seattle to do so, since our dollar is almost equal. Truly Redonkulous! Wish I knew how to sew, my MooCat Yitzy would look hilarious in this. Reminds me of a sting ray, but not the cute baby one posted a while back. Not something I want to see at the end of the hallway at 3am! I prefer the mousie pillow, and it's only $14.99. I'm surprised the cat bed is that pricey. Most of the Ikea stuff like this is dirt cheap; litter boxes for 5$ and cat "tents" for 7$. But, I'm an Ikea junkie. Yeah, we thought about buying this the last time we were at IKEA, but then we saw the price. However, for $19.99 you can get a sheepskin big enough for a kitty to sleep on. Our tortie loves hers. oooh I want this one in ceramic as a potty for my baby pleees. This would be perfect for my black cat Amir, if only he weren't partial to enclosed spaces! But so cute! almk: I LOL'd at the mouse sleeping pad! I'm an ikea junkie, too; my new apartment is going to be furnished mostly with ikea. My family never bothers to buy bedding for our cats 'cause they always find something around the house that they find quite comfortable and Murphy's law tells me if we bought something, they wouldn't sleep on it. Too much $$ though. Luckily Benny and Fatty already have a cat tree AND a nice sheepy-fur bed to sleep in. Actually, that would make a wonderful dog bed. I would love to see a foo-foo white puppy sleeping in it! It's a replacement pad for it (only $5), but the kicker is the pad has a TAIL. Whyeee? I guess this thing has a complicated pee absorbing construction, hence the higher price. 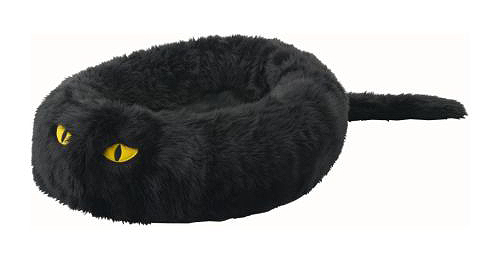 I like how the IKEA website lists it as a "cat/dog bed". As if any self-respecting dog would sleep in this. HA! Did anyone else notice that the description included the note that "this product requires assembly"? What in the world would you have to assemble? My rule of thumb is that the cats can't have more expensive toys or bigger furniture than me. And this thing requires assembly? I've assembled things from Ikea before. That scares me. i bought this for my black cat (my husband is going to send in pictures) a few months back. the assembly is putting the cat cover on a foam donut basically. it's insanely cute. i think that it's even cuter in person. thats not silly thats dumb!!!!!!!!!!!!!!!!!!!!!!! Thanks for making me smile, CO, I really needed that. Our family dog, a 16-and-a-half black Lab-Golden Retriever mix, had to be put down tonight. We got him when I was in 8th grade, and he lived with my mother these past 8 years. He was a fantastic dog and had a great personality until the end. The family won't be the same without him. Aw, Alexis, I'm sorry to hear that. I can't imagine what a black lab - golden retriever mix would look like, but I bet he was one happy dog! Sorry for the OT-ness, but it just reminded me... you think this is bad... I wanted to buy a Hello Kitty hat for my boyfriend's kitty, and it cost $160 dollars! Who buys that crap? Who says the Swedes have no sense of humour?